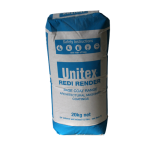 Unitex® Uni-Dry Cote® Redi Render™ | Unitex® Your Walls, Our Pride. Designed for application over clean brickwork and blockwork. It is available in both fine (Harbour Fine) and medium grades. Generally for skim coat work, it is applied in 2 passes – a build coat and then a final sponge finish. Coverage is 3-4.5 m2 per bag.